Hey friends! As we head into the weekend I thought I’d share a recipe from my latest book, Sweetness, with you. This Lotsa Crumb Cake is a cake recipe that I developed after LOVING the ones I purchased in the grocery store. I think the crumb topping is my favorite part so I set out to make a crumb cake that had lots of topping but stayed put while I ate it. This is that cake! It has a rich buttery bottom and a mile high crumb that is to die for! This recipe can be found on page 83 of Sweetness. Sweetness is shipping from online retailers now (many already have their copy!) and it hits store shelves Monday, November 7th. I’m on my way to Kentucky today for my first book signing in Frankfort tomorrow. Next week I have signings in Huntsville AL, Chattanooga TN, and Fayetteville TN. For more information on my tour, please click here. To take an inside peek in my book, please click here. Preheat the oven to 350 degrees. Lightly coat a 9 X 13 inch baking dish with cooking spray and set aside. Place the cake mix, milk, eggs, vanilla, and melted butter in a large mixing bowl. Beat with an electric mixer at medium speed until blended and smooth, scraping down the side of the bowl if needed, about 2 minutes. Pour the batter into the prepared baking dish. In a separate medium sized bowl, combine the butter, flour, brown sugar, and cinnamon and cut together using a long-tined fork or pastry cutter until well mixed and crumbly. Sprinkle the crumb mixture over the top of the cake batter. Bake until a toothpick inserted in the center comes out clean, about 45 minutes. Allow to cool slightly and then sprinkle the top with confectioners' sugar, if desired. Thank you, Bobby! Pour the coffee and I’ll cut us a slice! Got my copy of Sweetness yesterday ! Can’t wait to try this recipe and a whole bunch more ! Thanks, Christy…you’re the best ! Thank you so much, Lily!!! I hope you love it! Lol!! You’re welcome. It gave me a chuckle. Yeah I noticed it in the newsletter first haha:) have a great weekend!! Looks perfect for the Oldies Dance dessert table tomorrow night at church…thanks, Christy! I, too, love the grocery store crumb cakes and will be tring these out some time soon! Thank you! This looks great! Can I use skim milk in place of whole? Ha ha! I love and was waiting for this post! I too love the ones at the store but they are so small and expensive. 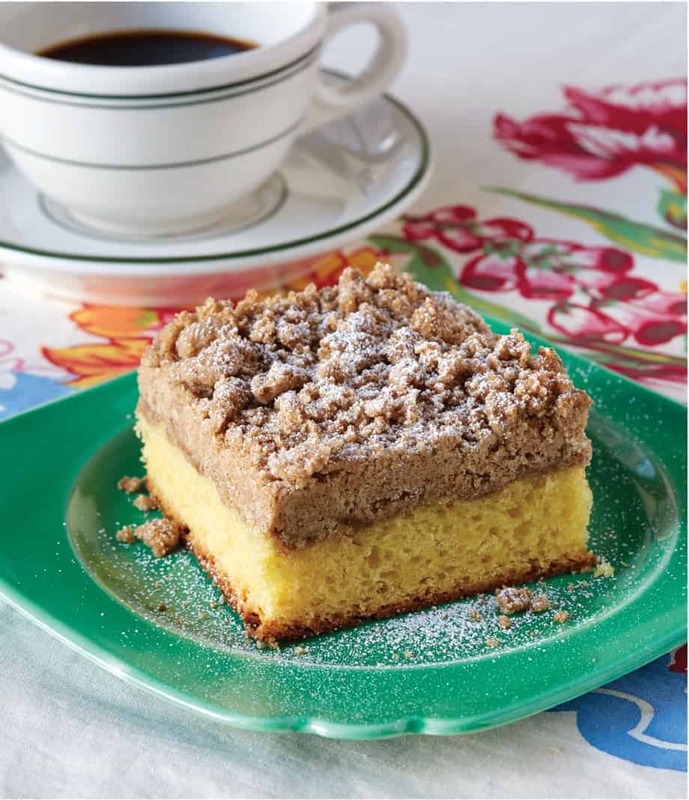 I mentioned to my dad a couple of months ago that I needed to find me a good crumb cake recipe as they are great with a cup of coffee anytime of the day! Well, just as I was finishing saying that a thought came to my mind, “I’ll bet Christy has a good one”. I came to your site and didn’t find a traditional recipe but I immediately thought, “I’ll bet she’s got one in her new cookbook”! So I waited…and lo and behold…here it is! I greet thee beloved, coveted crumb cake recipe with open arms and hungry tummies! I will be making you ASAP!! Can I use Splenda Brown Sugar in place of the regular brown sugar? That cake just looks so good, but I know that if I even think about it with that much sugar, my blood sugar count will be over the moon. I am so glad to hear that you are enjoying the book Darrellyn!!! …I’m originally from New York and this Crumb Cake reminds me of what is so popular back there. I can’t wait to make it. I love recipes that don’t require a ton of ingredients. Thank you so much Judy, I appreciate all of your support!!!! Oh my, this cake is deeeelish. I made it because we love cinnamon streusel topping. The cake is so tender and moist and that topping is fabulous. I gave a piece to my husband’s coworker, who doesn’t like ‘sweet’ and she loved it. This is better than any coffee crumb cake I’ve ever had. Goes well with either tea or coffee and it’s not too sweet. It’s GREAT! Thank you so much, Christy!!! You are the best! Wow, now this is the last word on crumb cake! Equal parts struesel to cake, that’s fantastic. I’m going to give this is a try, as your dessert recipes are always the best and never time consuming. Thanks. I’ll never buy store bought again. I need a cup of coffee just looking at this beautiful cake. I love my Sweetness Cookbook. I hope you get the chance to make one soon Barbara!! Welcome to Kentucky,WE are excited that you are here.Just gotta have this book. I have all the others. Love all you recipes and posts. Thank you so much Roxie, I hope you enjoy this one as much as you do the others!!! How long the cake stay fresh and is the cake called coffee cake or another name? Love the cake and have made it twice but both times the cake came up over the topping, so my topping was in the middle the first time and today it was on the bottom! Still tastes great 🙂 Any idea on what I’m doing that might cause that issue. I use a Duncan Hines butter cake mix. Thanks a bunch!